So, of course, we now have to put up with anti-fluoridation propagandists as they scurry to misrepresent the review’s findings. I have written before about how Stan Litras, a New Zealand anti-fluoride propagandist, indulges in cherry-picking, misinformation and outright distortion of the science (see for example Cherry-picking and misinformation in Stan Litras’s anti-fluoride article). Well, he has been at it again – this time putting his talents for misrepresentation to use on the new Cochrane Review. In fact just not true! Let’s compare his claims with what the Cochrane review actually reported. Stan claims the review “finds the science does not support claims that water fluoridation is of any benefit to adults.” Of course, Stan is implying that the review investigated the situation for adults and found no benefit. Stan implies the review found that fluoridation did not “reduce social” inequalities. The review team did find 3 studies reporting effects of water fluoridation on disparities in caries across social class. However, there were problems with all 3 studies meaning the data was not suitable for further analysis and this prevented them drawing any conclusions. So, it raises the possibility that the current efficacy of community water fluoridation in industrialised countries could be lower. However, they could not draw a conclusion on this because only 30% of the included studies took place after 1975. Stan claims (or at least strongly implies) the review shows claims “that tooth decay increases in communities when fluoridation is stopped” are incorrect. Stan claims the review “found that 40% of children in fluoridated areas have dental fluorosis.” However, the review does not compare the prevalence of dental fluorosis in fluoridated areas and unfluoridated areas. It simply draws conclusions about the likely prevalence of dental fluorosis at different fluoride intakes. This lack of comparison is unfortunate, although the omission may be due to the lack of suitable studies that survived their strict criteria. So Stan’s claim is misleading because, without considering dental fluorosis in the non-fluoridated, areas it is not possible to attribute any responsibility to community water fluoridation. He has simply taken the reported estimate of dental fluorosis for a fluoride intake of 0.7 ppm (the concentration in fluoridated drinking water in NZ) without taking into account the prevalence of dental fluorosis in unfluoridated areas. Very misleading! The review does, however, calculate estimates of dental fluorosis for different drinking water concentrations and we can draw some proper conclusions from these. Total dental fluorosis. The review defines this as all the forms of dental fluorosis according to the Dean Index – from questionable to serious. (See Water fluoridation and dental fluorosis – debunking some myths for a discussion of the different forms of dental fluorosis). 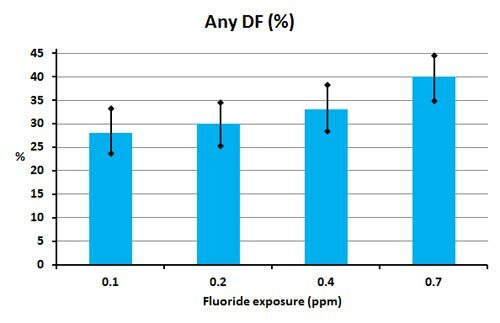 The graph below shows the reviews findings for the effect of fluoride exposure (drinking water fluoride concentration) on any dental fluorosis. True, at 0.7 ppm (the usual concentration for CWF, this shows an estimated prevalence of 40%. But we can calculate the increase due to CWF by subtracting the prevalence for non-fluoridated water. So dental fluorosis due to CWF would be 40% – 33% = 7 % of people (using the review’s concentration for non-fluoridated water of 0.4 ppm) or 40% – 30% = 10 % of people (using a more realistic concentration of 0.2 ppm). So Stan is quite wrong to imply CWF causes a total dental fluorosis in 40% of people – it is only 10% or less. However, even that figure is misleading. Most dental fluorosis is not of aesthetic concern – in fact, the milder forms are often viewed positively from the point of view of the quality of life. So the review also considers dental fluorosis of aesthetic concern – which they define as the serious, moderate and mild forms of dental fluorosis (their inclusion of mild forms here is questionable). The graph below illustrates their findings for these forms of dental fluorosis. So, if we consider only those forms of dental fluorosis the review considers of aesthetic concern then calculated prevalence due to CWF amount to only 12% – 10% = 2% of people (using the reviews definition of non-fluoridated) or 12% – 9% = 3% of people using a more realistic concentration of 0.2 ppm for non-fluoridated. This is a huge difference to the 40% claimed by Stan. The review acknowledges that their inclusion of mild forms of dental fluorosis in their definition of dental fluorosis of aesthetic concern is questionable, saying “mild fluorosis may not even be considered an unwanted effect.” Most studies do not consider the mild forms undesirable. It is likely that most of the increase in “dental fluorosis of aesthetic concern” arising from community water fluoridation occurs in the mild forms. So my suggestion of a 2 or 3% increase in “dental fluorosis of aesthetic concern” will be an overestimation. It is unsurprising, then, that some cross-sectional studies do not detect any increase in undesirable dental fluorosis attributed to community water fluoridation. The figure below illustrates an example reported in the New Zealand in the 2009 New Zealand Oral health Survey (see Our Oral Health). Once again this anti-fluoridation propagandist has been caught misrepresenting the scientific literature on this issue. And his misleading press release is being touted as gospel truth by anti-fluoridation groups in NZ and the USA. It is pathetic such people have to resort to misrepresentation in this way. Surely it is a sign of desperation to use statements that no conclusions were possible on specific details (adult benefits, social inequalities, influence of toothpaste, and what happens when fluoridation is stopped) because no studies fitted the selection criteria as “evidence” that there is no effect. Iheozor-Ejiofor, Z., Worthington, HV., Walsh, T., O’Malley, L., Clarkson, JE., Macey, R., Alam, R., Tugwell, P., Welch, V., Glenny, A. (2015). Water fluoridation for the prevention of dental caries (Review). The Cochrane Library, (6). Maupomé, G., Clark, D. C., Levy, S. M., & Berkowitz, J. (2001). Patterns of dental caries following the cessation of water fluoridation. Community Dentistry and Oral Epidemiology, 29(1), 37–47. I am always suspicious when activists present simple figures to confirm their bias and fool their audience. I think anti-fluoride activists do this a lot. Here is an example in Paul Connett’s presentation to the recent Sydney anti-fluoride conference. Connett uses data from Xiang et al (2003) and some of Xiang’s other papers and presentation to push his claim that fluoridation is bad for your IQ. Apparently he and Bill Hirzy (currently described as Fluoride Action Networks “chemist in residence”) are working on a paper attempting to justify a case that the maximum permissible level of fluoride in drinking water should be reduced to practically zero! They use a simplification of data from Xiang’s paper for this. First of all the figure shows what Xiang’s data is like. 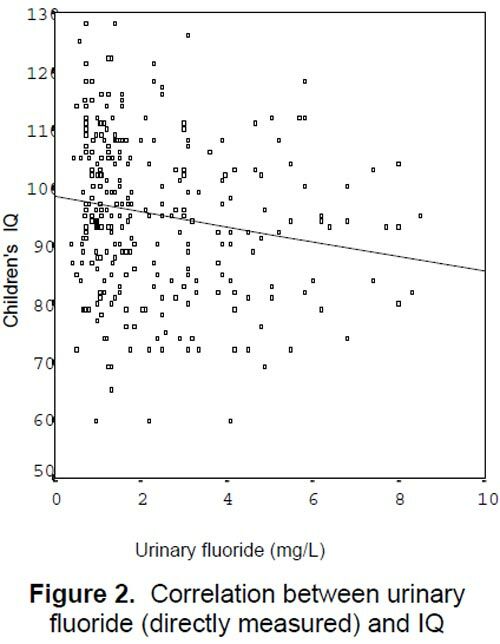 It compares IQ with urine fluoride concentration – unfortunately he did not give a similar figure for fluoride concentration in drinking water. However, this is well correlated with urine fluoride. There is certainly a lot of scatter, but Xiang (2003) reports a “Pearson correlation coefficient of 0.174, p=0.003.” So a statistically significant relationship (helped by having a large number of samples) but it still only explains about 3% of the variance! This is important because, although Xiang did consider some confounding factors he could well have missed a factor which explains more of the variance which, when considered, may make the relationship with serum fluoride concentration non-significant. For example, I would be interested to see a statistical analysis which included incidence of moderate and severe dental fluorosis as this may be more important than the drinking water fluoride concentration itself). But have a look at how Paul Connett present this data (or the equivalent data for drinking water fluoride concentration) in his Sydney anti-fluoride conference presentation. The “trick” has been to divide the data into “categories” based on inclusion in a separate water fluoride concentration ranges and then presenting only the averages within each category. I can see the point of sometimes using such categories, but this figure conveys a very misleading message. The Sydney audience could have been excused for thinking that Xiang’s data showed a very strong connection between IQ and drinking water fluoride – a relationship explaining almost all the variance. Completely misleading as this relationship probably only explains only about 3% of the variance in the original data. It really is a matter of “the reader beware.” Never take on trust what these political activists are saying. Always go to the original sources and consider them critically and intelligently.